Representative Honours: Northern Ireland: 14 Full Caps (1951-1958); Irish FA Representative; Sheffield & Hallamshire FA Representative.. Originally an inside-forward with Linfield Swifts, Len Graham converted to full-back with leading intermediate club, Brantwood. He moved to England in October 1949 as one of Peter Doherty’s first signings for Doncaster Rovers. That season saw the Vikings claim the Division Three (North) title, and promotion to Division Two. Graham however played just a handful of games during the campaign, not making his debut until 18 March, in a 2-0 win over Wrexham. With Graham established as a regular at full-back, a position he would hold for the next eight years, Doncaster did a fine job of consolidating their position in the higher Division. By the end of the season he had won his first two caps for Ireland. He remained Ireland’s regular right-back through to the mid-1950s, before being displaced by former understudy, Willie Cunningham. Club boss Doherty kept Graham involved with the international squad, using him as an occasional stand-in left-back, and including him in the initial squad of 22 for the 1958 World Cup. 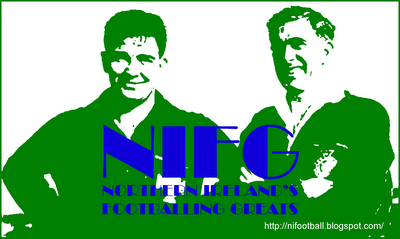 Graham was a member of the Irish FA squad that toured North America in 1953, and was also included in a number of other Irish selects, playing against the likes of the British Army, and twice for an All-Ireland team against an England Select in the Dublin An Tostal festival matches of 1955 and 1956. Graham won his final cap, as deputy for Alf McMichael in Northern Ireland’s first post-World Cup match, in a 3-3 draw with England. It took his total to fourteen, which remains a Doncaster Rovers club record. Having suffered relegation to Division Three with Doncaster at the end of the 1957/58 season, Graham quickly made the step down to Division Four, as he was transferred to Torquay United in November 1958. At the end of that season he left the Football League, and having gained his FA Coaching badges while at Doncaster, took the job as manager of Ards. He struggled to fill the void left by George Eastham and, despite leading the Castlereagh Park club to the Irish Cup Final (where they lost out 5-1 to Linfield), he was sacked after one season. During this period he also coached the Northern Ireland 'B' team. 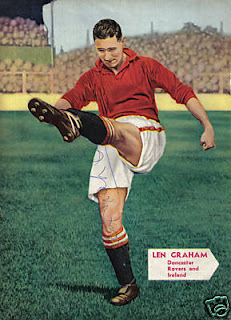 Later a coach with Stoke City during the 1960s then with Blackpool from 1967 to 1975, Len Graham sadly passed away in Blackpool Victoria Hospital on 30th September 2007. Summary: 14/0. Won 2, Drew 4, Lost 8. Sadly Len passed away on the 30th September 2007 at Blackpool Victoria Hospital...with much appreciation a minutes silence was acknowleged at the Keepmoat Stadium Doncaster on Tuesday 2nd October 2007. Sadly missed by all who knew him.